Merry Christmas to any readers who celebrate it! 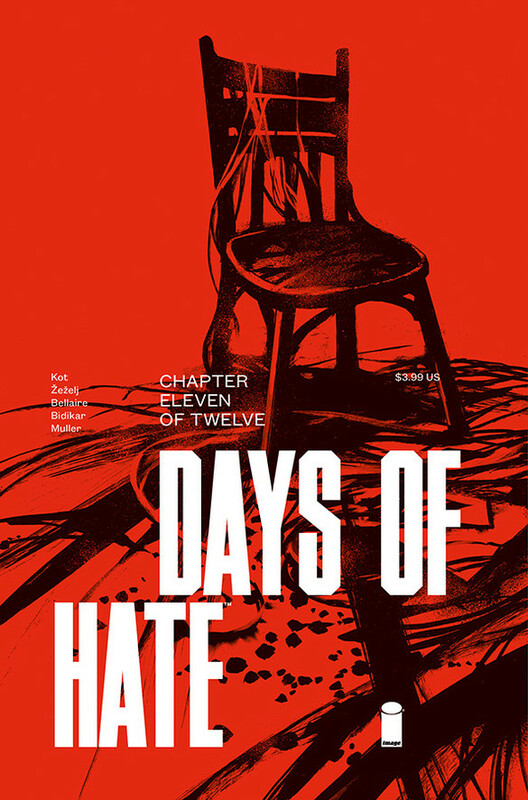 Days of Hate #11 – The penultimate issue of this amazing series is a pretty heavy one. After the events of last issue (I don’t want to spoil much), the architect is in prison, and she is visited by the man she’s been having an affair with, who is a major Republican operative. This issue, more than any other, makes plain the extent to which Ales Kot is using this series to comment on the present state of division in America, and while it’s a bleak issue, it also gives some reason to hope that things will get better. As always, Danijel Zezelj kills it. This ended up being a much smaller and quieter series than the first couple of issues suggested, but it still works for me, maybe more so because of that. I look forward to the big ending. Beasts of Burden: Wise Dogs and Eldritch Men #4 – The Wise Dogs come face to face with the humans who have been making life hard for them lately, in a big fiery conclusion that is an exciting read. This miniseries is very different from every one that went before it, not just because Jill Thompson is nowhere to be seen, but because this is the first BoB story to prominently feature the Wise Dogs, and to feature humans. It was a great read, and artist Benjamin Dewey did not make me miss Thompson a bit (although it did remind me that I wish more of his and Kurt Busiek’s excellent Autumnlands comic existed). Good stuff. 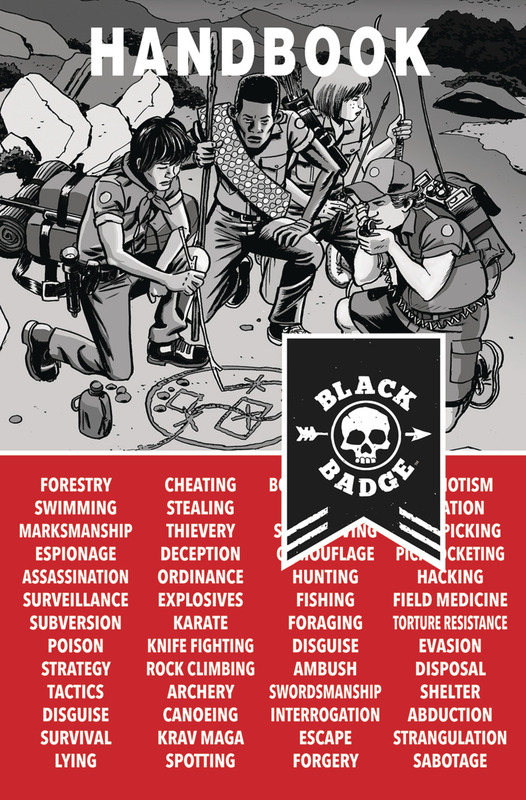 Black Badge #5 – The Jamboree is on, and that means that our troop of Scouts are competing against other groups with different black ops specialties. At the same time, the mystery surrounding missing Scouts and a possible rival entity deepens. This is a very enjoyable series, and it’s interesting to see Matt Kindt apply his usual approach to secret organizations to one filled with children. Tyler Jenkins continues to impress with his art. Captain America #6 – We spend most of this issue with the Lukins, as we learn about how Alexa Lukin has organized the Power Elite, and what her goals are. We also see Steve Rogers becoming a suspect in a pretty high profile murder, which sets up the next story arc. I like how Ta-Nehisi Coates has been writing this series, and am curious to see where he’s going to take Cap. Darth Vader #25 – Charles Soule and Giuseppe Camuncoli’s run with Vader comes to its end, and it’s all a little underwhelming, if I’m being honest. Vader makes his way through the portal he’s been trying to open for a while, where we see a few too many scenes from his life (I never like being reminded of the Phantom Menace). 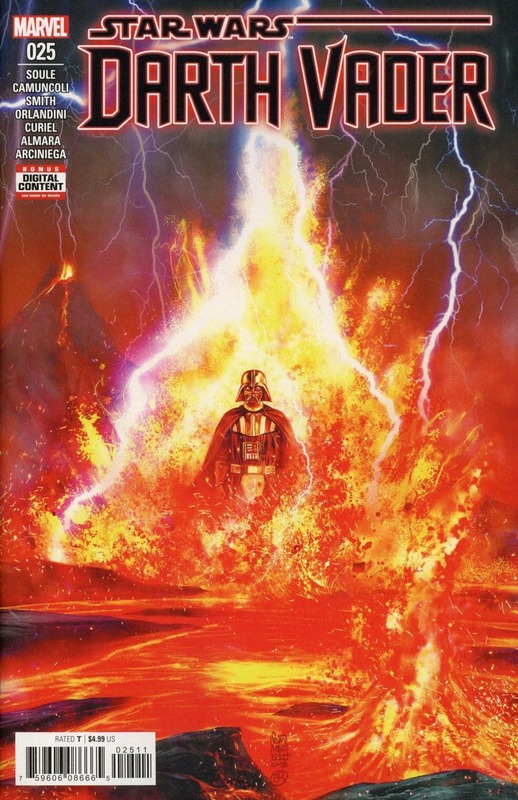 I liked the early issues of this run a great deal, but as Soule worked to transition Vader from the passionate and angry Anakin Skywalker into the cold and menacing figure from A New Hope, things got kind of dull. Extermination #5 – Ed Brisson and Pepe Larraz bring this miniseries, and with it, the Bendis era of X-Men, to a satisfying ending, bring a fan favourite character back, and tie up any number of plot threads. It’s not an easy trick to pull off, and I’m doubly impressed that the book was enjoyable. I’m not sure that bringing the original X-Men into the present was ever a good idea, but it did lead to a few good moments. This book managed to close their story in a way that felt respectful to the characters and the material. And now I can read the Aftermath special that came out a few weeks ago! Friendo #3 – This series, which was already a little odd, gets even weirder with this issue, as Leopold tries to rob a Wal-Mart (it’s called Cornutopia in the story, but we know what it is), and then because of a new law that allows all manner of criminality if in the interests of corporate promotion, gets hired to keep robbing Wal-Marts. The focus is less on the problems that will be associated with data-mining AI, and moves into even larger social commentary, as writer Alex Paknadel also introduces a Russian hired killer to the mix. This series might be jumping the shark, but Paknadel has earned my trust, so I intend to see where he’s headed with this one. 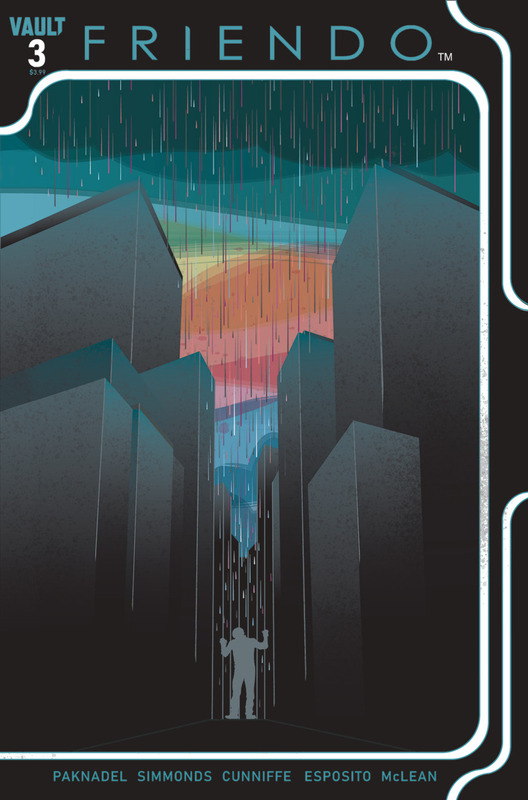 Gideon Falls #9 – The weirdness continues to deepen as Norton gets freed and taken to a place he remembers from his childhood, and as the priest looks for answers. Jeff Lemire has made this comic in such a way that it’s difficult to explain, but contains so much story logic that everything makes sense as you read it. That’s not easy to do. Andrea Sorrentino shines on this book. Iceman #4 – This second chance at an Iceman series has been a disappointment, compared to the joy that was Sina Grace’s first run. I don’t know if the problem is that he’s trying too hard to establish Bobby as a major player, or if he’s been told to tone down the personal stuff, but everything feels forced. As Bobby decides to go after Mister Sinister on his own (which makes no sense), half the issue revolves around Kitty and Storm getting ready and then appearing at a Mutant Pride event, which has no real bearing on the story at all. It’s kind of a mess, this issue. 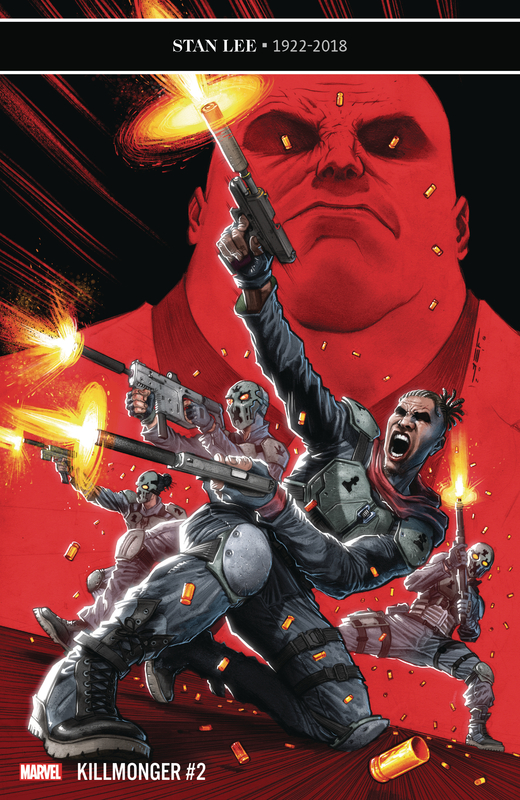 Killmonger #2 – N’Jadaka has joined a small squad of assassins on contract to the Kingpin, and is learning how to focus his anger in this role, but there is danger that the Kingpin is not as pleased with his employees as he used to be. This is another solid issue from Bryan Hill and Juan Ferreyra. Livewire #1 – I really enjoyed the first issue of Livewire’s ongoing series, but a reader who hasn’t read Secret Weapons and Harbinger Wars 2 would be hopelessly lost here. The characters aren’t really introduced, which didn’t bother me much, but does make this a tough sell to a curious new reader. Amanda wants to connect with the kids from the Secret Weapons series, but they are understandably upset with her, and not all that interested in dealing with her. At the same time, she is the most wanted person on the planet, so she’s got some bounty hunters looking for her. Writer Vita Ayala has a good handle on all of these characters, and artist Raúl Allén is fantastic, as always. The Valiant line has been feeling a little moribund lately, but I hope this might be the title that pushes it back on track. 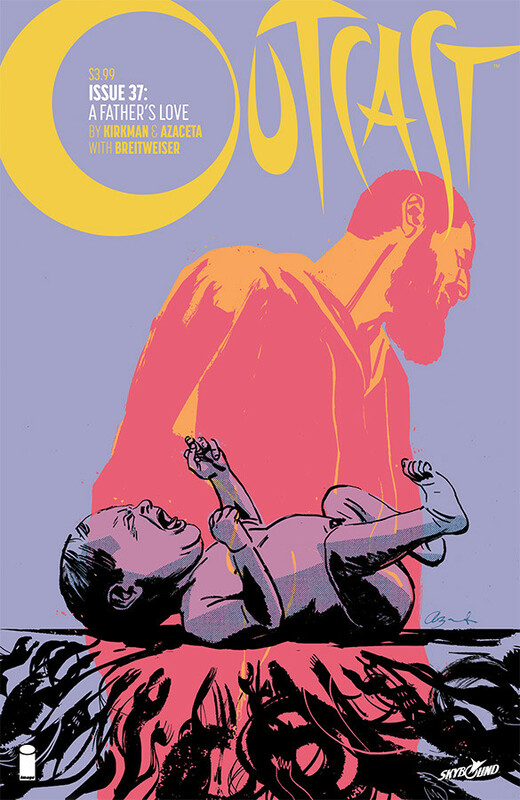 Outcast by Kirkman & Azaceta #37 – It’s been a while since we’ve had a new issue of this series, and now that we do, it’s a flashback issue that tells us Simon’s story, at last. We learn why Simon abandoned Kyle and his mother, and what he did in the years before he returned. Along the way, we learn a very small bit more about some of the other Outcasts. There are only twelve issues left in this serie, but that seems like the right number, as Kirkman has been building towards a conclusion for a while now. Punisher #5 – Matt Rosenberg’s Punisher is great fun, as Frank works his way through a string of Hydra operatives, making his way towards Baron Zemo, only to find a small collection of superheroes waiting for him. This book is much darker than anything else Rosenberg is writing right now, and I think that’s why it works so well. Great Szymon Kudranski art doesn’t hurt, of course. Uncanny X-Men #6 – The X-Men confront X-Man, with very little success this week. I’m growing increasingly disappointed in how underwhelming this series has been so far, yet I still have this weird hope that things will get better once the weekly storyline ends. That’s Stockholm Syndrome, isn’t it? 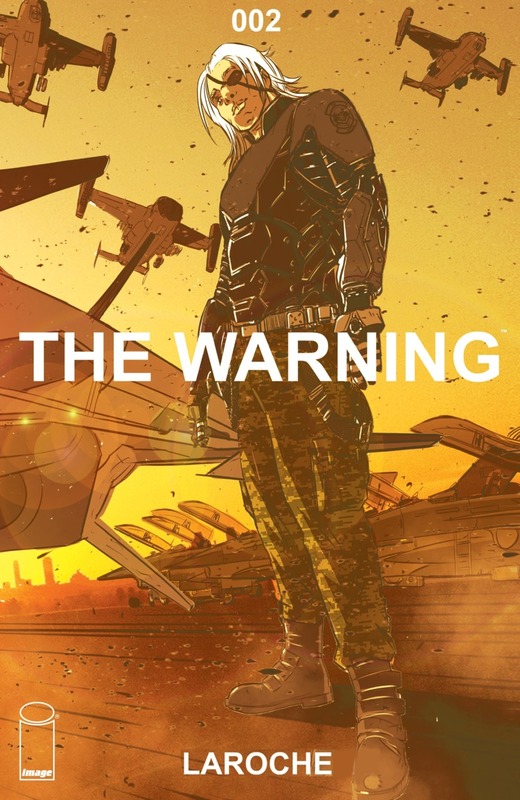 The Warning #2 – I’m really feeling this new series from Edward Laroche, even if it reads more like the cut-scenes of a video game than anything else. With an alien threat having appeared through a portal, there is a small group of enhanced soldiers tasked with leading the defense. Characterization is slow to build, as Laroche focuses on the toys and tricks of this story. His art is very nice, and his jet sequence in this issue pretty exciting. It’s cool. X-Men: The Exterminated #1 – I’ve been a fan of Lonnie Nadler and Zac Thompson’s Marvel work, especially their Cable run, and believe they are fitting writers for this afterword to the Extermination series. Hope misses Cable, and visits all of his safehouses with Jean Grey as a way of mourning him. The main story works, although I’d think it would be more likely for Hope to hunt down the younger version of Cable that killed him. The backup story, by Chris Claremont, is nice, but hard to place, continuity-wise, and relies a lot on infants having a good memory. At the end of the day, I’m not sure this issue needed to exist; I would like to see more Thompson and Nadler work in the mutant realm, though. X-O Manowar #22 – The story arc with the beings from the Unknown comes to its end, and I’m not sorry to see it go. This book is slipping lately. Amazing Spider-Man #2 – I think that the team of Nick Spencer and Ryan Ottley is really clicking, as Peter ends up back in school, and fighting Taskmaster and Black Ant. I don’t like it when Taskmaster is used as a joke villain – he’s actually pretty cool – but otherwise, it was great to see some Ottley action scenes again. This is a classic approach to Spidey, but still modern feeling. I want more. 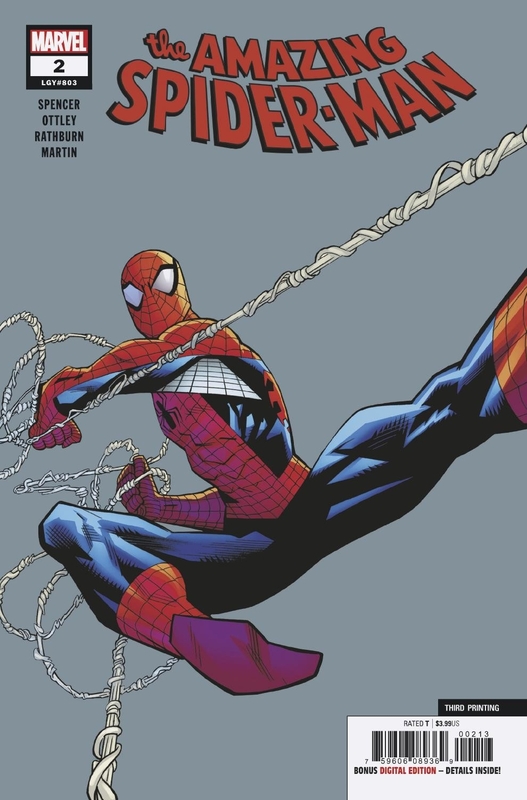 Amazing Spider-Man Annual #1 – It’s kind of random that Saladin Ahmed and Garry Brown would give us a look back at the days before Peter Parker realized that his nifty black suit was in fact an alien being. I don’t know why we’d need to revisit this era right now, but at the same time, the story, narrated by the symbiote that would become Venom, works very well. It was cool to see Peter’s old apartment once again (complete with his recognizable coffee table), and Brown’s art is always welcome, as is classic costume Black Cat. Captain America Annual #1 – Tini Howard made her Marvel debut with this story about Cap and Bucky behind enemy lines in the waning days of WWII, helping a trio of concentration camp survivors to escape to Allied territory. It’s a fine comic, without being memorable. It’s weird to see Ron Lim art in 2018, and Chris Sprouse’s work doesn’t stand out the way it often does. 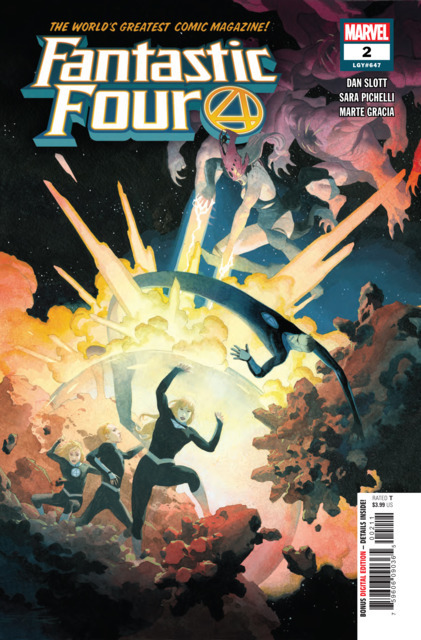 Fantastic Four #2 – I’ve been seeing a lot of praise for Slott’s Fantastic Four, but I’m not really getting it after two issues. This one shows us that the Future Foundation and Molecule Man have been busy exploring universes that Franklin Richards has created, making him a God-figure, and that Franklin and Valeria have both become older, while the other FF students have not appeared to have aged. As they explore, they run afoul of a cosmic entity called the Griever, and now they need to get help if they are to stop her from killing trillions. It doesn’t capture the sense of optimism or humour that Jonathan Hickman (or Matt Fraction, for that matter) embedded into these kids, and comes off feeling a little forced to me, with Reed playing semantic games. Maybe it gets better in later issues? Infinity Wars #3 – It’s hard to believe that Gerry Duggan spent months and months setting up this storyline, and in the final analysis, it’s about Gamora using the Infinity Stones to merge a ton of heroes like some early 2000s rap mash-up mixtape. Where is the War that the title refers to? Where is the purpose, too, as this seems, half way through the miniseries, like a rambling, directionless mess. 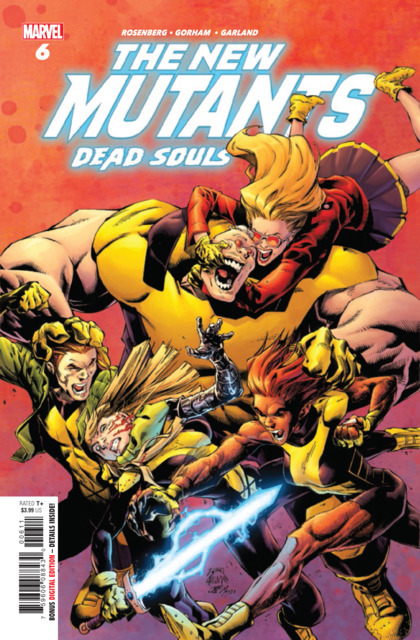 New Mutants: Dead Souls #6 – Matt Rosenberg ends this series in a surprising way, which helps explain why we haven’t seen many of these characters lately. I’m not sure where and when the odd conclusion to this title is going to get picked up, but I’m going to assume it will happen in the Uncanny X-Men at some point. This whole series felt a little too forced and manufactured; a more organic approach would have worked better.